The DoD justifies paying Leidos up to $1.1 billion more for its EHR implementation by mentioning the unstated cost of adding the Coast Guard while redacting the list of “as a service” requirements and their associated costs that the VA included in its contract that the DoD had to add after the fact. Allscripts and CACI challenged DoD’s sole-source selection of Leidos for the contract extension, but were rejected with the rationale that the government isn’t interested in bringing another EHR into the mix. 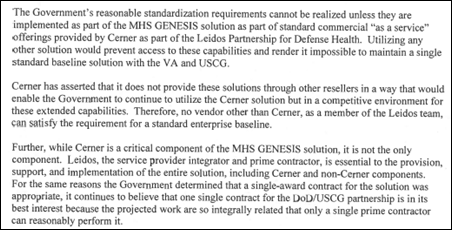 Meanwhile, Leidos says in its earnings call that it will serve as Cerner’s subcontractor in the VA’s implementation, providing services for program management, implementation, help desk, and security. From Magic Kingdom: “Re: Orlando Health. Going Cerner.” Unverified. The job description of the CIO who was hired earlier this year said that the health system will be choosing a new EHR after running Allscripts Sunrise for around 15 years. Adventist, the other big system in town, is a Cerner shop, and Orlando Health uses Cerner lab. But nothing’s been announced and I haven’t seen any relevant open position listings. If the rumor is true and the process is far enough along (and I have no knowledge of either), the announcement would probably come Thursday when Cerner post Q2 earnings. From Health System Exec: “Re: consultants. Is it possible for you to ask where your readers would go to find a list of consulting firms that can handle a large health system’s full ERP implementation? (human capital, materials management, finance and accounting). Gartner? KLAS? Other?” I’ll open it up to readers to post a comment about their sources (not specific consulting firms since that’s not the question). From RxPriceResearcher: “Re: drug prices. Is there a public or federal database that maintains historical medication prices? For example, I would like to compare the price of Tylenol 500mg from 1990-2017.” Medicaid publishes a database that goes back to 2013. The only source I know otherwise is from Wolters Kluwer and it’s not free. It’s hard to even understand the effect of “price” since the US healthcare non-system involves a hidden web of contractual discounts and rebates that make it less meaningful. From Vague Gravity: “Re: Optum and Recondo. Confirming Eligible Bachelor’s rumor from Friday with the attached email.” The customer email from both companies says that, as the reader’s rumor said, Recondo has taken over Advisory Board’s Payment Navigation Compass reimbursement product, which Recondo has been reselling under the Empowered Patient Access name. The email notes that both Optum and Advisory Board are owned by UnitedHealth Group, which is a “key shareholder” in Recondo (I don’t think I knew that). From James: “Re: hospital sleep. Not really news, just confirmation of what we know.” A JAMA Internal Medicine-published survey of 2,000 inpatients in the Netherlands asked a simple question – how did you sleep last night compared to at home? Patients reported sleeping 83 percent less and 70 percent said they were awakened due to external causes, half of those due to hospital staff. Rest was most commonly interrupted by the noise of other patients, medical devices, pain, and toilet visits. I’ve spent just one night in a hospital and it was anything but restful and recuperative, hitting every anecdotal cliche in been awakened by vital sign checks, IV tinkering, hallway staff exuberance, and the racket of beeping and wheezing machines from my own bedside and that of my roommate in what was supposed to have been a private room. I will posit that length of stay would be longer if hospitals had better accommodations, food, and hospitality instead being barely better than a prison, which is probably a good thing since it’s not supposed to be a vacation (not to mention that every hour in a hospital bed increases your chances of being harmed by the never-ending screw-ups). 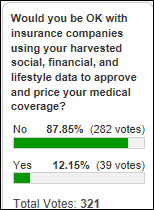 The vast majority of poll respondents don’t want health insurers making coverage or premium decisions based on their harvested, non-medical data, which of course will return to legality once again following the White House’s scuttling of the ACA, which set minimum standards for coverage and policy terms that benefitted even those who buy insurance from their employers. The business of health insurance is interesting since pricing every other kind of insurance — auto, homeowner’s, life, and malpractice — requires the applicant to disclose everything that might affect the insurer’s risk even though those insurers don’t pay out until the subscriber experiences a catastrophic, measurable event, with premiums set by that person’s risk. Health insurance pays routine costs for accumulated health conditions starting almost immediately, yet we don’t want those insurers knowing too much about us. It’s like a reverse Las Vegas, where the house’s lack of information and forced participation gives gamblers the edge, with the solution being that insurers either overcharge and bank handsome profits or pull out of a market entirely, all based on the risk pool they’re stuck with. This week’s question, based on the Montefiore resident who may be fired over unproven accusations that he posted white supremacist writings under another name – Is it OK to fire an employee over unsavory but legal off-the-job activities? Internet lynch mobs who were raised on TV judge shows love playing armchair jury and going personally after someone who has done or said something they don’t like — even when that person hasn’t been charged with a crime or the information source is unvetted — and companies that are worried about taking a bottom-line hit find it easier to just fire them in publicly shared indignation. Any resemblance to actual legal process is coincidental – it’s short attention span, “I know it’s true because I read it on Facebook and someone is trying to hide it even though I haven’t read a newspaper in years” outrage, because everybody is required to be outraged by everything these days. I gave the “wish I’d known” series a short vacation since summertime responses were sparse, but I’ll revive it this week with a reader-requested question in a slightly different format.The reader says we need more positive stories and I agree. Welcome to new HIStalk Platinum Sponsor Apixio. 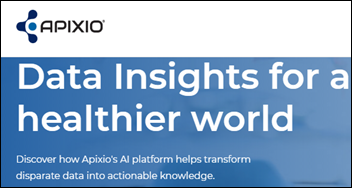 The San Mateo, CA-based company offers an AI-powered data insights platform that creates a comprehensive picture of a patient’s medical history, then applies data classifiers and predictive models that give insights to their health to support delivery of personalized and affordable care. It also offers an efficient, accurate, and complete risk management solution that turns unstructured data into meaningful data to maximize coding efforts while remaining compliant, with an average ROI increase of 400 percent and productivity gains of 4-7x over manual, low-tech methods. Quality measurement expert Darren Schulte, MD, MPP has worked in healthcare analytics and technology for a long time and has been with the company since 2011. Thanks to Apixio for supporting HIStalk. I always head over to YouTube to scope out a new sponsor, so here’s the intro video I found for Apixio. I’m losing a handful of sponsors that (a) have hired empowered but industry-clueless marketing people who don’t know what HIStalk is; or (b) are too broke to continue their sponsorship. Contact Lorre to replace them. I don’t lose many sponsors except by acquisition, so it boosts my self-esteem to replace the others. Vocera announces Q2 results: revenue up 8 percent, adjusted EPS $0.09 vs. $0.02. Carilion Clinic (VA) joins TriNetX’s global health research network to assess its patient population for suitability for clinical trials. Nemaha Valley Community Hospital (KS) has switched from Medhost to Cerner. Essentia Health (MN) is replacing Caduceus Systems with Tecsys supply chain management software, to be completed by June 2019. Stonewall Memorial Hospital (TX) will replace Evident (CPSI) with Athenahealth in October 2018. A literature review finds that consumer-facing diagnostic websites and apps – excluding those that are approved or being reviewed by FDA, that perform physical tests, or that offer only literature searches – are poorly supported by clinical studies and sometimes offer low accuracy rates. The categories included symptom checkers, smartphone photo analysis for skin or eyes, and crowdsourced problem solving. The authors recommend that studies name the apps they are reviewing (as they would in medical device studies), consider how the apps work (algorithms versus attached devices), and follow a standardized evaluation methodology. A data-crunching research project tries to associate EHR adoption with 30-day mortality, predictably failing to conclude much of anything useful for obvious reasons: (a) EHR adoption isn’t binary since use may vary widely; (b) the study used old data from 2008-2013; (c) the authors obviously had no way to prove causation of EHRs to deaths, only to find a faint correlation that is likely to be dependent on a zillion more relevant factors that changed over those years or that differ among hospitals. I want to perform studies that correlate hospital quality to CEO salary, the average Kelly Blue Book value of cars parked in the doctors’ lot, and the number of self-congratulatory awards and signs posted in public areas. This is dope: A study finds that 25 percent of people who show up in the ED with a sprained ankle were given a prescription for opioids. Are all these tests meaningful, exhaustive, and supported by evidence? Do we really need more vague diagnostic measurements that rope people into a medical system they would do well to avoid? Is this just another form of the “executive physical” that allows health systems to sell high-margin, medically questionable services that the rest of us can’t afford and probably don’t need? Do you go to Mount Sinai because you don’t trust your own doctor who knows you well and who offers — instead of buzzword-heavy gadgetry — medical expertise, empathy, and chronic care? Is Mount Sinai doing this to improve population health, the health of wealthy folks who can afford this test, or just its own bottom line, patient funnel, and marketing reputation? Do we really need more diagnostic tools when much of our population can’t afford treatments for their known chronic conditions? 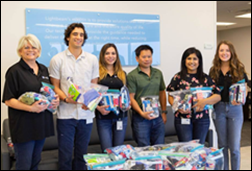 Lightbeam Health Solutions employees donate toiletries and snacks to charities serving the homeless in Dallas. 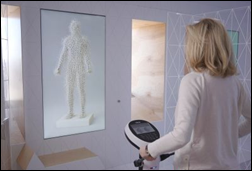 MDLive joins Walgreen’s new digital healthcare provider marketplace. Waystar will exhibit at the NextGen Texas Regional Client UM August 2 in Irving. Netsmart will exhibit at the HCAF Annual Conference July 30 in Orlando. Voalte CEO Trey Lauderdale will speak at the Sarasota Young Professionals Group on August 10. Mission Health President and CEO Ronald Paulus joins Vocera’s board. Re: Mount Sinai Hospital’s (NY) Lab100, — This is like a flashback to the Executive Physical Programs that had marketing success in the 90’s. I recall launching an evidence-based focused program for a large academic facility, just to learn that the #1 reason we lost out to patients or companies was because the large academic facility on the other side of the same city included a free golf swing analysis. This time they just use the marketing hook of ‘technology”. Re: This is dope. Having just recovered from a severe ankle sprain/chipped bone, I was grateful for whatever pain reliever was appropriate. I was given Narco in the ER and sent home with 5 tablets. How anyone could become addicted after that is beyond me. Any confirmation for Orlando Health going Cerner? My consulting firm is interested in helping with the build.